Paragon has completed a gruelling 1,385-mile cycle challenge on LandAid day, November 1, in its latest efforts to raise funds and awareness for the property industry’s youth homelessness charity. 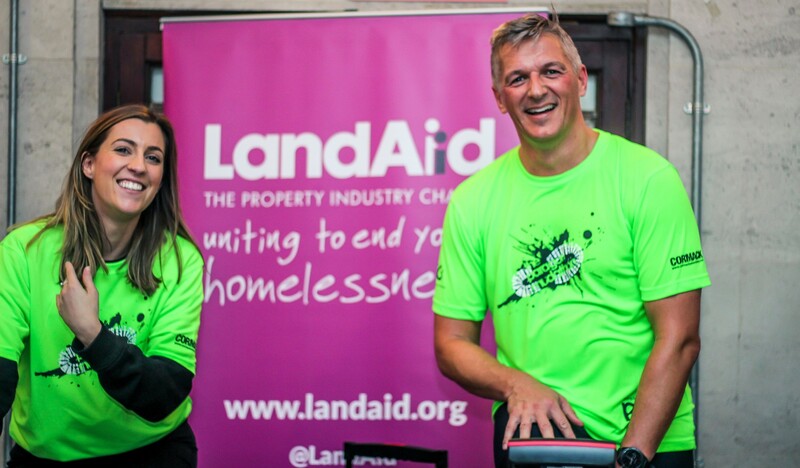 For LandAid day – the property industry’s biggest day of fundraising – all four offices took on a cycle challenge on static spin bikes. The team far exceeded its combined target of 874 miles, reaching an impressive 1,385 miles on the day, far enough to travel from Paragon’s Edinburgh office to MIPIM in Cannes. Paragon’s managing director, John Munday, also completed his own nationwide challenge, travelling between the Manchester, London and Esher offices and cycling for an hour with each team. This fantastic challenge follows the success of Paragon’s Mudathon held in September, which raised £14,000 for LandAid and MacMillan Cancer Support, when 331 property industry professionals took on the annual extreme 5K mud challenge. As LandAid’s 80th Foundation Partner, Paragon has committed to an annual donation of £10,000 for the next three years, as well as raising a further £30,000 through its own fundraising events. Funds will support The Amber Foundation in Dorking – part of LandAid’s ‘sponsor a home’ project – on the renovation of a Georgian manor house with improved facilities for 30 young people who have been homeless. LandAid’s director of fundraising and partnerships, Alice Lamb, said: “We’re hugely grateful for Paragon’s ongoing dedication to supporting LandAid. The team’s new status as a Foundation Partner is a serious commitment and the £40,000 they’re raising this year will bring us one step closer to ending youth homelessness in the UK. This charitable challenge was arranged by Paragon’s LandAid Ambassadors Paul Arthur, Katie Smith and Andrew Hezelgrave in the London office, Oliver Brown in Esher, James Onions in Manchester and Jamie March in the Edinburgh office. Support for the cycle challenge has kindly been provided by Sandown Sports Club in Esher, Everyone Active on Marshall Street in central London and Kudos Wheels in Manchester. John Munday added: “We’re pleased to have taken our relationship with Landaid to the next level. They do fantastic work assisting numerous homeless charities, and we’re particularly proud to support the Amber Foundation project in Dorking which is near two of our offices.